The Tax Cuts and Jobs Act suspended or trimmed several cherished tax deductions that individuals count on for savings. So, exactly how bad is it and what can you do about it? The lion’s share of the $1.5-trillion tax cut goes to corporations (C-Corps). The Act lowered the corporate rate from 34% to 21%, a flat rate starting in 2018 and switched from a global income-tax regime to a territorial tax system. The Act made most C-Corp tax cuts permanent, giving multinational corporations confidence in long-term planning. Democrats lambaste the Act because most of the individual tax cuts expire at the end of 2025. Republicans probably expect Democrats to cooperate in making the individual tax cuts permanent before the 2026 mid-term elections. An expanded AMT exemption to $109,400 married and $70,300 single. Children’s income no longer taxed at the parent’s rate; kids must file tax returns to report earned income, and unearned income is subject to tax using the tax brackets for trusts and estates. The most contentious deduction modification is to state and local taxes (SALT). After intense deliberations, conferees capped the SALT itemized deduction at $10,000 per year. The Act allows any combination of state and local income, sales or domestic property tax. SALT may not include foreign real property taxes. The Act prohibited a 2017 itemized deduction for the prepayment of 2018 estimated state and local income taxes. Individuals are entitled to pay and deduct 2017 state and local income taxes by year-end 2017. Consider that SALT is an AMT preference item; it’s not deductible for AMT taxable income. Many upper-income and middle-income individuals fall into the AMT zone, so they don’t get a full SALT deduction. The Pease itemized deduction limitation also trimmed the SALT deduction for 2017 and prior years. Many business owners deduct home-office expenses (HO), which include a portion of real property taxes and that allocation is not subject to the $10,000 SALT limit, and the home office deduction is not an AMT preference item. Here’s a tip: Report 100% of real property taxes on home office form 8829, to maximize the HO deduction. Deduct state and local income taxes, and the remainder of real property taxes, to reach the $10,000 SALT limit on Schedule A. When you factor in a more substantial standard deduction for 2018, many individuals may not lose as much of their SALT deduction as they fear. With lower individual tax rates, they might still end up with an overall tax cut. The Act does not permit a pass-through business owner to allocate SALT to the business tax return. For example, an S-Corp cannot reimburse its owner for his or her individual state and local income taxes paid in connection with that pass-through income. SALT is still allowed as a deduction from net investment income for calculating the 3.8% Obamacare net investment tax. High-tax states are fighting back against the SALT cap. State and local jurisdictions are setting up 501(c)(3) charitable organizations to fund state and local social costs, including public schools. Residents would make charitable contributions to the state 501(c)(3) and receive credit for real property and or state income taxes. This type of restructuring would convert non-deductible SALT payments into tax-deductible charitable contributions. It will be difficult to arrange, and the IRS may object, so don’t hold your breath. High-tax states have significant transfer payments to people in need, and it seems appropriate to consider it charity. The Act retained the medical-expense itemized deduction, which is allowed if it’s more than the AGI threshold. In 2017, the AGI threshold was 10% for taxpayers under age 65, and 7.5% for age 65 or older. The Act uses a 7.5% AGI threshold for all taxpayers in 2018, and a 10% threshold for all taxpayers starting in 2019. Medical expenses are an AMT preference item. As of Dec. 15, 2017, new acquisition indebtedness is limited to $750,000 ($375,000 in the case of married taxpayers filing separately), down from $1 million, on a primary residence and second home. Mortgage debt incurred before Dec. 15, 2017 is subject to the grandfathered $1 million limit ($500,000 in the case of married taxpayers filing separately). If a taxpayer has a binding written contract to purchase a home before Dec. 15, 2017 and to close by Jan. 1, 2018, he or she is grandfathered under the previous limit. Refinancing debt from before Dec. 15, 2017 keeps the grandfathered limit providing the mortgage is not increased. The Act suspends unreimbursed employee business expenses deducted on Form 2106. Speak with your employer about implementing an accountable reimbursement plan and “use it or lose it” before year-end 2018. See a list of these items below. Miscellaneous itemized deductions include tax compliance (planning and preparation) fees. If you operate a business, ask your accountant to break down their invoices into individual vs. business costs. The business portion is allowed as a business expense. See the complete list of suspended miscellaneous itemized deductions in the Joint Explanatory Statement p. 95-98. Here are the highlights. The Act suspends the personal casualty and theft loss itemized deduction, except for losses incurred in a federally declared disaster. If a taxpayer has a personal casualty gains, he or she may apply the loss against the gain. The Act added professional gambling expenses to gambling losses in applying the limit against gambling winnings. Professional gamblers may no longer deduct expenses more than net winnings. The Act raised the 50% limitation for cash contributions to public charities, and certain private foundations to 60%. Excess contributions can be carried forward for five years. The Act retained charitable contributions as an itemized deduction. But, with the suspension of SALT over the $10,000 cap, and all miscellaneous itemized deductions, many taxpayers are expected not to itemize. Some taxpayers won’t feel the deduction effect from making charitable contributions. Consider a bunching strategy, to double up on charity one year to itemize, and contribute less the next year to use the standard deduction. Another bunching strategy is to set up a charitable trust like at Fidelity. The Act suspends alimony deductions for divorce or separation agreements executed in 2019, and the recipient does not have taxable income. The Act significantly expands the permitted use of Section 529 education savings account funds. “Qualified higher education expenses” include tuition at an elementary or secondary public, private, or religious school. There are many other changes, but they are not in the mainstream. 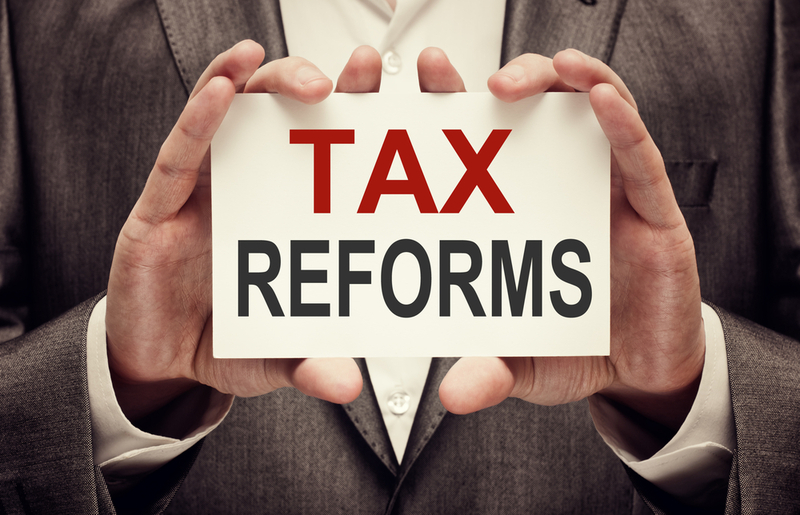 This entry was posted in 2017 Tax Cuts and Jobs Act (TCJA), Tax Changes & Planning and tagged tax cuts, tax reform on December 29, 2017 by Robert Green.